The movies, the documentaries, the museum exhibits. They often tell the same story about the “unsinkable” Titanic, her wealthy passengers, the families torn apart, and the unthinkable end. 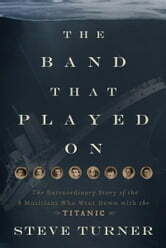 But never before has “that glorious band”—the group of eight musicians who played on as the Titanic slipped deeper and deeper into the Atlantic Ocean—been explored in such depth. Steve Turner’s extensive research reveals a fascinating story including dishonest agents, a clairvoyant, social climbers, and a fraudulent violin maker. Read what brought the band members together and how their music served as the haunting soundtrack for one of modern history’s most tragic maritime disasters. 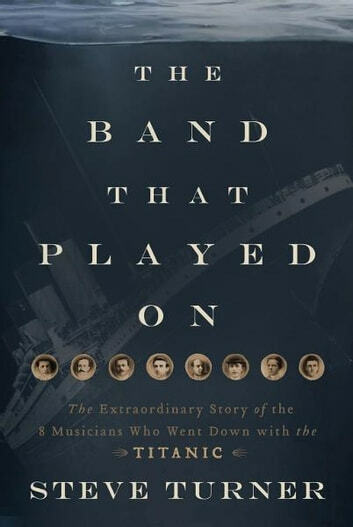 The Band that Played On by Steve Turner is, surprisingly, the first book since the great ship went down to examine the lives of the eight musicians who were employed by the Titanic. What these men did―standing calmly on deck playing throughout the disaster―achieved global recognition. But their individual stories, until now, have been largely unknown. What Turner has uncovered is a narrow but unique slice of history―one more chapter of compelling Titanic lore. For Turner, however, the undisputed hero of the book is Wallace Hartley, a fine musician with religious conviction and a powerful sense of duty who seems most likely to have been the force behind those final hours of heroism. In the last pages of the book, Turner reveals a surprising Hartley discovery―a turn of events which makes a fine ending for his worthy book, even as it leaves us hopeful that the Titanic may yet have a few mysteries she is willing to give up.
. . . For those the least bit interested in the Titanic tale, this is another intriguing chapter in the legend. This detailed and sympathetic portrait of the bandsmen will be appreciated by Titanic enthusiasts and casual readers alike. Steve Turner's new book admirably fills a gap in Titanic literature. There are few good books on the subject of Titanic and, until now, none on the band itself. Steve's impressive depth of research has allowed him to vividly flesh out the stories of each of the band members and he has set these narratives in a fascinating social, political, cultural and religious context. I only wish Steve's book had been around when I was researching Wallace Hartley for my role in James Cameron's movie! —Jonathan Evans-Jones, who played band leader Wallace Hartley in the film Titanic. Filling at last a historical gap, this is the definitive account of those neglected and abused heroic bandsmen. Steve Turner has done a fine and exhaustive job of research on those splendid souls who did exactly what musicians, as service providers, do best: soothe and give succor. I wish I'd had this book at hand when I put together my recording of the White Star Orchestra's music: I could have made the thing a lot more accurate! A worthy, thrilling and moving book.